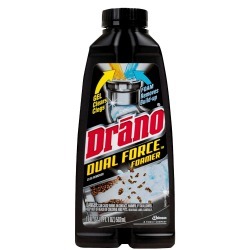 Melissa has shared her Drano Dual Force Foamer clog remover review. When a drain clogged in the house I used to get the phone book and call the plumber, but not anymore, now that I finally found a drain cleaner that works for me. This foaming product is amazing. It's easy to use too. The bottle is divided into two parts, and when you pour them out and they mix together they begin to form a thick foam. The product was mostly odor free, only a slight detergent smell, but otherwise nothing to serious. Once in the drain you just let it sit for a while and it will eat its way through your clog. After it sits for a while you flush the drain with hot water. It worked great on its first pass through in the pipes at my house. I used it to unclog a bath tub, one of the worst clogs to clean manually and all I can say is that I will never go back to the old wire hanger to fish out the hair. Overall I would give it 5 of 5 stars, since it worked exactly as it said it would. No complaints here. Thanks Melissa for your review of Drano Dual Force Foamer clog remover. This product actually sounds very similar to Liquid Plumr Foaming Pipe Snake, a product which also is two different liquids which when combined form a foam to remove clogs in your drains. I looked up more information about it once you sent me in this review, and it is also advertised as being safe for all pipes and septic systems. I would love to hear from more people who have used this product, sharing how it has worked (good or bad) for you. You can share your drain cleaners review here, for this or any other brand, telling me what you like, or don't, about it and why, and how you've used it in your own home. In addition, you can read additional reviews of other products which have already been submitted.